I, like many other PhD students, am wracked with nerves when it comes to any supervisory meeting that falls on my calendar. It seems quite bizarre really considering not a whole lot can happen. But that is the question we ask ourselves: what’s the worst that can happen? Will my supervisors tell me to pack up all my books and folders and never return? Will they breathe fire? Or, will they tell me everything I have written is absolutely awful and ask why I ever bothered to do a PhD in the first place? All these questions may seem a bit over the top but after having conversations with friends who are in the same boat, I don’t seem to be far off the mark. But, what we should ask ourselves is; what’s the worst that can happen? Most likely a few remarks that hit below the belt followed by a few tearful drinks down the pub in my experience. And those remarks aren’t always as bad as you might think. They are guidance disguised in a red pen. One piece of advice that I was given at the very start of this long and arduous journey is that I shouldn’t take criticism personally. It is a very hard thing not to do because you have poured your blood, sweat and tears into your work and have tried your best but the corrections keep on coming. Your work is not a reflection of who you are as a person but rather your intellectual ability which is being moulded into an academic mind. I find that the PhD Comics help in times of crisis because somehow they manage to sum up all the frustrations and panic that the average PhD student feels in times of stress. 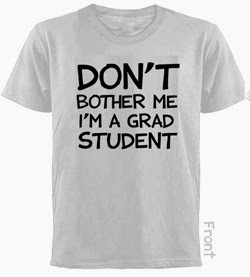 I am very tempted to get their t shirt that says “Don’t bother me I’m a grad student” and put it on my office door so my supervisors know I’m hard at work when really I’m writing a blog post or playing with Refworks. Perhaps there should also be a t shirt saying “Don’t take it personally- it’s just a thesis”. I think that it may not be as popular but don’t worry, I won’t take it personally!